One of the biggest disadvantages of TVs going slimmer is that the quality of audio from them has deteriorated. Thankfully, this gave birth to a new category of products which worked as a plug and play accessory to the idiot box. These products, called soundbars have gained a lot of popularity in the past few years. Today we have with us a budget soundbar from the house of Xiaomi. It is priced at Rs 4,999, brings with it good sound output, but also has some minor flaws. In the box you get the soundbar along with the power cable and a SPDIF cable. It also comes with screws in case you decide to wall mount the soundbar. Considering the price of the soundbar, it is very well build. It has a plastic body all around and it feels quite solid. There is no noticeable flex and the plastic does not depress no matter where we press it. Apart from the front, the rest of the body is all white which looks classy. The only downside is that it will get dirty easily so you will end up cleaning it a lot. At the back, there are brackets to wall mount the soundbar and it is nice that the bar comes with screws in the box to wall mount it. Speaking of the front the Mi Soundbar has a fabric mesh in the front which does give it a premium look and feel. When it comes to the controls, you have physical buttons on the top of the soundbar for input options and the volume controls. Overall, the construction of the soundbar is solid and the look especially with the front fabric is quite premium. At first glance, one wouldn’t think that this is a 5k soundbar. 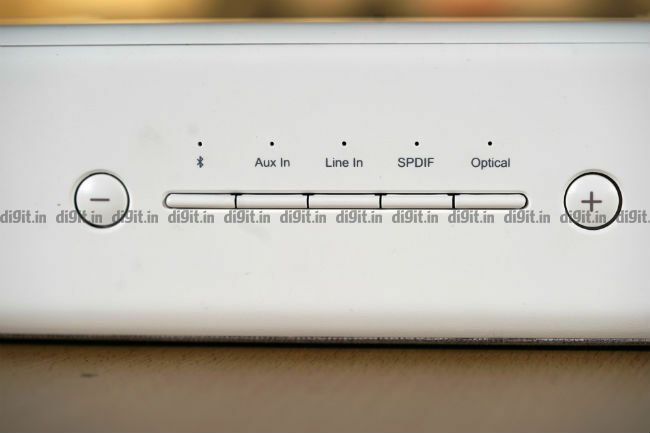 Speaking of connectivity options, at the back the speaker has 1 Aux port, 1 Line in port, 1 S/PDIF port and 1 Optical port. It also supports bluetooth connectivity. The power port is also at the back and everything is neatly laid out. The soundbar doesn't come with a remote control in the box. 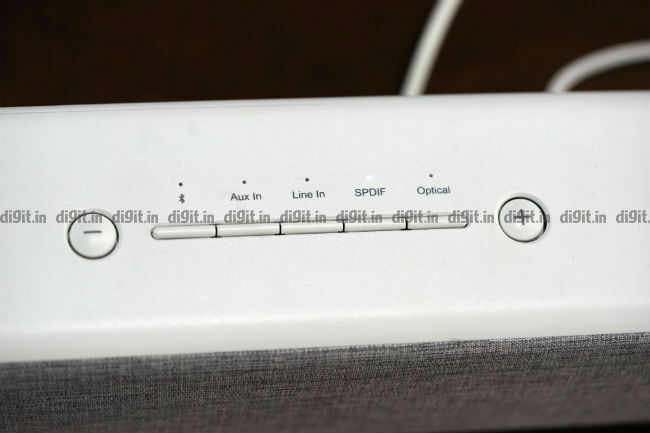 instead, all the input selections are neatly laid out at the top of the speaker along with the volume controls. There is a white LED indicator to show which source is currently in use. When it comes to bluetooth connectivity, the soundbar can only remember one device at a time which is a bummer. One can argue that HDMI ARC missing is not a good sign, but considering the price point, we think the connectivity options on offer are a good selection. 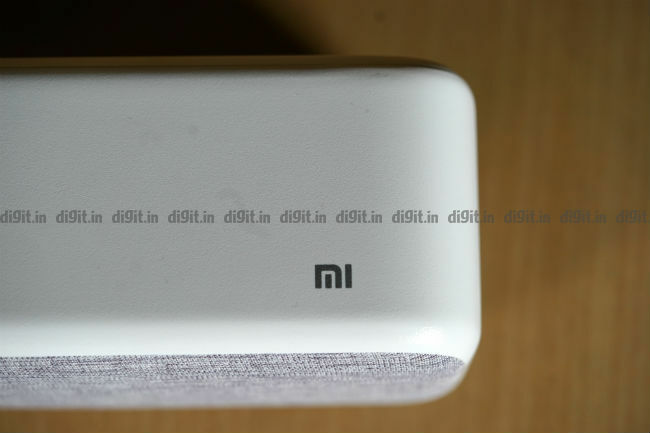 Also, all Xiaomi TVs available, new and old have S/PDIF and the company is bundling the cable in the box for ease of connectivity. Xiaomi claims that it will take you 30 seconds to set up the soundbar and if you know what you are doing, then yes, it can be done in half a minute. Simply connect it to a power source, connect it to your TV with the input available and Bob's your uncle. There is no remote control in the box which initially didn’t seem necessary, but the more we used the soundbar, the more we missed a remote control. Delving into performance, most of the content played to test the soundbar was played using Bluetooth and S/PDIF to see the difference between the wired and wireless performance. Since the Mi TV 4A Pro (read our review of the TV here) can connect to the speaker with bluetooth and S/PDIF, this was easy to achieve and test. Another thing worth mentioning is that yes, a sub would have been nice, but the speakers built into the soundbar do pack in enough of a punch that it isn’t missed. Speaking of the speaker setup in the soundbar, we have two 20mm dome tweeters, four passive radiators, and two 2.5 inch woofer drivers. When watching action movies like John Wick and Wonder Woman, the speakers were loud and at full volume have the ability to shake an average sized bedroom. Placed on a wooden table, you can feel the table vibrate with every thump. During a fight sequence, when John Wick changes guns, you can make out the signature sound of each gun adding to the immersion. Watch a movie like Spider-Man Homecoming and the mix of high octave music with action and Spider-Man’s quirks are easy to decipher. Not to mention the sound of his web shooter spitting out webs. We recommend not going beyond 80 percent volume mark to enjoy the audio from the speaker. It is ample loud and clear at 80 percent. At full volume the speaker was too loud for my bedroom and the conference room in office where we tested the speaker. Moving to TV shows like Young Sheldon or Modern Family, these shows have more vocals with less emphasis on the background score. Here too the vocals are clear, clean and have no distortion whatsoever. However, there is one thing I’d like to recommend here. Ensure there is no object in front of the speaker that can bounce the sound. This could be something as simple as a flower vase on a table between you and the TV or your set top box placed right in front of the soundbar. I’m not saying there shouldn’t be any object between you and the speaker. That's not possible in an average household. However, you should be in direct line of sight of the speaker. That will ensure you don't hear things like echos or some form of distortion in the sound. If there is one movie that can truly bring out the performance of a soundbar at low volumes, it has to be A Quiet Place. The movie is filled with quiet moments followed immediately with high octave action or creatures scratching. The movie also has a lot of sounds like a timer ticking, fireworks, high pitch audio and more bringing a diverse audio experience in one package. All of this was well executed on the Mi Soundbar and made the movie a lot more immersive. Moving to gaming, we played some Doom and Gears of War using the speaker. 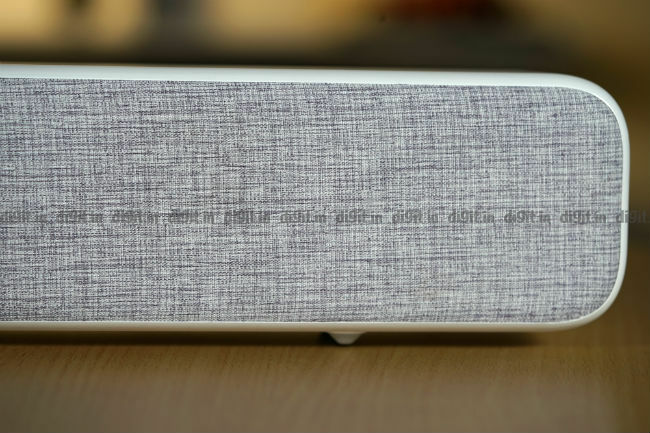 What we missed in the speakers of Xiaomi TVs is more than made up for using the Mi Soundbar. The bass is back. And yes, for true bass lovers, you will need a soundbar with a sub. However, if you are one that wants good audio from games then the soundbar definitely gets the job done. From the bangs of the shotgun to the screech of the demons, the experience is good. If you are still reading this, you think that I absolutely love the soundbar and yes, considering the price to performance ratio, it is a value for money proposition. However, the soundbar isn’t perfect. So let’s talk about some of the shortcomings. Firstly, there is a dip in quality about 10 to 15 percent which is noticeable when you switch the source from wired to bluetooth. Wired will always give better performance than bluetooth and this is a fact but the noticeable dip means you should always choose a wired option to consume content when available. Also, on higher end speakers, the drop in quality between wired and bluetooth isn't as much as what we’ve seen on the Mi Soundbar. A nitpick is that there is little channel separation on the soundbar. If a plane flies from left to right, you should feel the audio move in the same direction. This happened very little on the Mi Soundbar. When you have demons all around you, in a game like Doom, the left and right channel separation is important to know which side you are being attacked from. 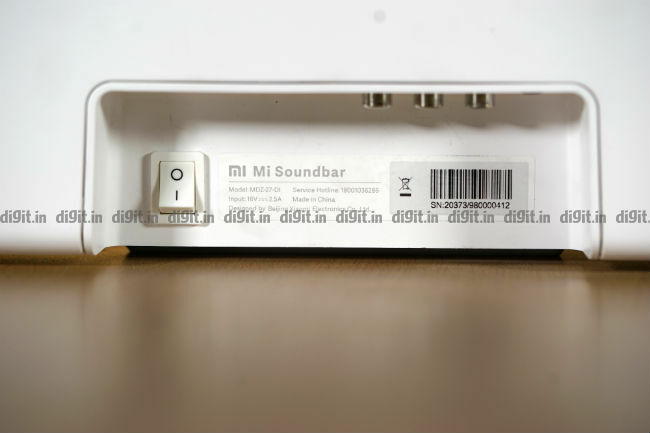 In the Mi Soundbar, the channel separation isn’t very obvious. The biggest problem however is the lack of a remote control. When connected via bluetooth to your TV or a smartphone, you can control the volume using the smartphone or the TV’s controls. When connected via AUX as well, this works. 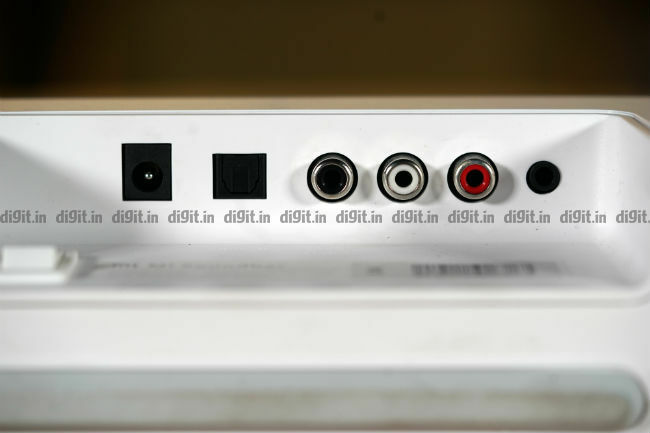 However, when connected via S/PDIF, you have no control over the volume with the remote control of the TV. We used the new Mi TV 4A Pro and when we connected the speaker via S/PDIF, and increased the volume using the TVs remote control, the audio was coming from both the soundbar and the TV speaker. We spoke to Xiaomi about this and they said that on Android TV 8, the S/PDIF control is locked from Google and Xiaomi is talking to Google to work on this. So if you want to use the soundbar via S/PDIF, then you will have to manually control the volume. Hence, we miss a remote control. Also, if you connect the soundbar with the old Mi TV, the one that does not have Android TV 8 and only PatchWall, you can control the S/PDIF output via the TVs remote control. Another problem arises if you have multiple devices connected to the inputs. Like my TV is connected via S/PDIF, my phone via bluetooth and my CD player via aux. If I need to change from one input to the other I need to walk to the speaker. Also, it doesn't help that only one device can be remembered via bluetooth at a time. So, even though the overall performance of the soundbar is great for the price, it has enough shortcomings to hinder the overall usage experience. Considering the price point and performance on offer, the Mi Soundbar can be a great companion for your budget TV. It packs in a punch, be it for gaming, watching movies and even music. 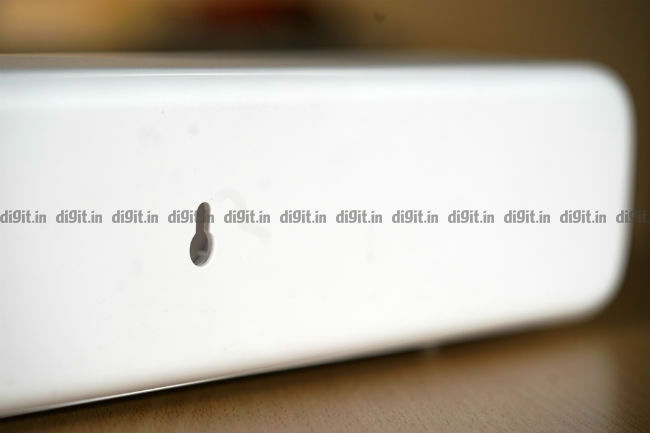 It has connectivity options that can cater to old TVs and new ones alike. And overall, the lack of a sub at this price isn’t missed. The soundbar is well built and looks good too. However, the inability to control volume via S/PDIF on Android TV OS is a downside and overall a remote control is missed, be it to change the source or even to control the volume. The channel separation is also weak. If you have a budget of 5k to spend on a soundbar for your TV, you can definitely consider the Mi Soundbar. It is a bang for your buck.